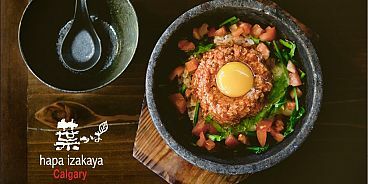 Hapa Izakaya has launched in Calgary. Their first Calgary location, at 816 11th Avenue SW, opened its doors to Calgarians at 5:00pm last night. The newly renovated 106-seat restaurant offers locals a taste of Tokyo’s izakaya pub scene; hot and cold Japanese tapas, fused with the West Coast’s emphasis on local, sustainable Ocean Wise seafood. Seasoned Chef-Owners, Toshiyuki “Iwa” Iwai and Takashi “Kin” Kanamori bring from Vancouver 18 combined years of Hapa Izakaya experience. Their passion for cooking is only equalled by the excitement they share of finally realizing their dream of opening their own izakaya in Calgary. Joining them from Vancouver is General Manager, Barret Jackson who spent the last three years honing his izakaya experience at Hapa’s Coal Harbour location. Born and bred in Edmonton, Barret is thrilled to be back in his native Alberta. Joining the Calgary team for the opening is Hapa Izakaya founder, Justin Ault and Hapa Robson manager, Andrea Sing. “As Calgary’s dining scene continues to blossom, ambitious and creative chefs and restaurateurs will bring to it new international influence. Hapa Izakaya is very proud and excited to be joining this vibrant community and we hope to one day join the ranks of Calgary’s best loved restaurants.” – Chef Iwa. The menu includes all of the favourites from Vancouver and Toronto. Canada’s original Ebi Mayo (tempura prawns tossed in spicy Japanese mayo sauce) makes it first appearance in Calgary, joined by standouts such as Gindara (baked sablefish, sake-miso marinade), Tuna Avocado Salsa Dip (Chopped Ahi Tuna, avocado, tomato, house-made plantain chips) and three Ishiyaki (hot stone bowl rice dishes) options. Fresh sashimi and creative sushi rolls round out the menu. From the bar, a selection of premium sake, fun cocktails and craft beer along with Hapa’s famous Takezake (chilled sake in bamboo flasks) help complete the izakaya experience. VIEW THE FOOD & DRINK MENU. Hapa Izakaya Calgary is open daily from 5pm until late. For reservations, please phone 403.452.6737. For more information, please visit HapaIzakaya.com, follow @HapaCalgary on Twitter and HapaCalgary on Facebook.